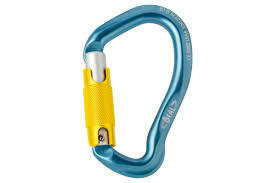 The Beal Be Link 3-Matic Carabiner is an asymmetrical screwgate carabiner for lanyards. Its design and shape make it particularly easy to use at the end of a lanyard to clip to a belay. The Beal Be Link 3-Matic is similar to the Beal Be Link Screw Carabiner but with a triple action locking gate for extra safety.